Update: As of Tuesday, September 4th, five other Dervish prisoners have joined the hunger strike. Their names are Babak Taghian, Ehsan Malekmohammadi, Salemi Salemi, Reza Bavi, and Akbar Dadashi. Human Rights Activists News Agency (HRANA) – Twelve of the Dervish prisoners at Great Tehran Penitentiary who were violently disbanded and sent to solitary confinement on August 29th after staging a sit-in have started a hunger strike, while at least 20 of those attacked are reportedly in poor health. Prison guards used batons, electrical shock, and tear gas on the prisoners to break up their peaceful protest, which had been in effect in Ward 3 since June 13th. The Twitter account of Majzooban Noor — a news agency publishing a feed on Dervishes, a religious minority — described the prison officials’ plan of attack, which involved filtering non-Dervish detainees from the quarantine area before charging those involved in the protest. According to Majzooban Noor, prison officials then welded shut the gate of the prison yard to surround a number of Dervishes, using tear gas on those who attempted to come to their aid. The prisoners involved in the sit-in, along with 18 Dervishes from Ward 4, were subsequently taken to solitary confinement. The August 29th raid occurred during a visit to the prison by Mostafa Mohebbi, the Director General of the organization Prisons of Tehran, who had come to inspect the Great Tehran Penitentiary following reports of deplorable conditions there. Mohebbi reportedly watched as the heads of the prison — identified only as Director Farzadi and his deputy, “Farrokhnejad” — personally inflicted skull and arm fractures, among other injuries, on the confined Dervish prisoners. Alireza Roshan, the director of Majzooban Noor, told HRANA that while many Dervishes were transferred to solitary confinement, others were individually dispersed among other Wards of the prison. He identified nine solitary confinement prisoners who started hunger strike upon their transfer: Ali Bolboli, Salehodin Moradi, Mohammad Reza Darvishi, Abbas Dehghan, Ali Mohammad Shahi, Mojtaba Biranvand, Ali Karimi, Jafar Ahmadi, and Ibrahim Allahbakhshi. “Their demands[…]are the reunification of the [Dervish] prisoners to one ward, the release of the female Dervishes [held in Gharchak Prison], and the lifting of the house arrest of Noor Ali Tabandeh, the group’s leader, who has been under house arrest since February 2018,” Roshan revealed. Three other Dervishes have since followed suit, according to Majzooban Noor, making for a total of twelve Dervishes currently starving themselves in protest. These three were identified as Heydar Teymouri, Majid Yarahmadi, and Saeed Soltanpour. Roshan said prison regulations stipulate that certain prisoners be kept apart depending on their offenses and beliefs, and that prison officials are responsible for ensuring the collective safety of their detainees. Prison guards reportedly pulled out some of the Dervishes’ hair, including their facial hair, during the August 29th raid. Human rights activists and families of the victims have recently raised concerns over a lack of transparency from prison authorities on the current condition of the Dervishes. The families of the affected Dervishes have written a letter to judicial authorities to demand immediate face-to-face visits with their imprisoned loved ones. The families are reportedly suspicious that authorities have enforced solitary confinement and delays on family visits in order that wounds and traces of violence have ample time to fade from the Dervishes’ bodies. Six of the dervishes who were beaten – Salehodin Moradi, Ali Bolboli, Mohammad Reza Darvishi, Sekhavat Salimi, Ali Karimi, and Ibrahim Allahbakhshi – have been transferred to Ward 1 of the Great Tehran Penitentiary, quarters for those convicted of common crimes. Others — including Reza Entesari, Sina Entezari, Kasra Nouri, Mehdi Eskandari, Reza Bavi, Amir Nouri, and Mohammad Sharifi Moghaddam — are being held in solitary confinement. *There are various divisions among Dervish religious groups in Iran. The use of Dervish in this article refers to Nematollahi Gonabadis, who in recent years have declared themselves followers of Twelver Shia Islam, Iran’s official state religion. Human Rights Activists News Agency (HRANA) – A new wave of widespread protests that began on Tuesday, continued across Iran through the week for six days. Protesters included merchants, shopkeepers and other citizens who gathered in objection to the worsening economic conditions in Iran. Their main concerns were centered around the issues of unemployment and the rising of prices and exchange rates. Rising prices, inflation, and unemployment have led to protests since December 2017. Protests in Isfahan on Shapur Jadid Street began with a strike by merchants and shopkeepers, which led to other citizens joining in on the protest. The gathering quickly turned violent when security forces attempted to disperse the crowd with tear gas and gunshots. In Karaj, people gathered in Gohardasht Square to hold a protest rally. According to reports, many women participated. Some protesters were reportedly arrested by security and plainclothes forces and are currently held at a Basij-operated center in the Gohardasht neighborhood. Protests in Rasht and Shiraz were accompanied by the heavy presence of security forces. Some of the videos from Shiraz indicate that a 7-year-old was shot with tear gas by police forces. Protesters in these burned tires on the streets to counter the effects of tear gas and chanted slogans including “Our enemy is right here, they are lying claiming it’s the U.S.”, “Guns and tanks are no longer effective, mullahs should get lost,” “No to Gaza, no to Lebanon — I give my life only for Iran,” “The nation begs while *He acts like he’s God” and “Down with high prices”. Mass protests also occurred in Isfahan and Karaj. 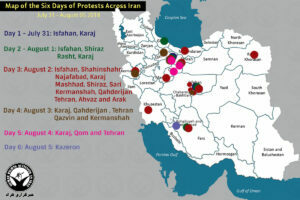 Protests were reported in twelve Iranian cities: Isfahan, Shahinshahr, Najafabad, Karaj, Mashhad, Shiraz, Sari, Tehran, Ahvaz, Kermanshah, Qahderijan and Arak. 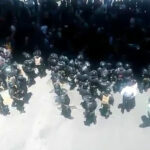 Peaceful protests turned violent in Isfahan and Shiraz when security, plainclothes and Basij forces shot at the protesters with guns and tear gas. In the videos from Thursday, protesters are seen throwing rocks at the Iranian authorities in response to the gunshots. Protesters are also seen starting fires in order to counter the effects of the tear gas. Many protesters were reportedly arrested in Mashhad and Shiraz. Protests occurred in five different cities: Karaj, Qahderijan, Tehran, Qazvin and Kermanshah. Since the early hours of Saturday, a strong presence of security forces had created an ambience of intimidation in many of the Iranian cities. Reports indicate that large protests were held in the central city of Qom, Karaj and Tehran. People were heard chanting “Iranians, it is time to demand your rights from this regime”, “Down with the dictator”, “Don’t let fear conquer, we are all together”, “The nation begs while He acts like he’s God”. Some reports claim that 50 of the female protesters were arrested in recent days and transferred to the quarantine ward in *Varamin’s Garchak Prison. Many of the state-run media or news agencies with ties to the government have either denied the existence of protests or play them down as rallies incited by opposition or simply gatherings with strictly syndical demands. The police forces in the cities of Mahdasht and Gohardasht (both located in the Alborz province) imposed restrictions on traffic and banned driving after 6PM in these areas. Reports from sources close to security institutions, one person was shot dead in Karaj and at least 20 others were wounded. Despite the persistence of security measures and the heavy presence of security forces aimed at intimidating citizens, protests were held in the city of Kazerun (located in the Fars province). 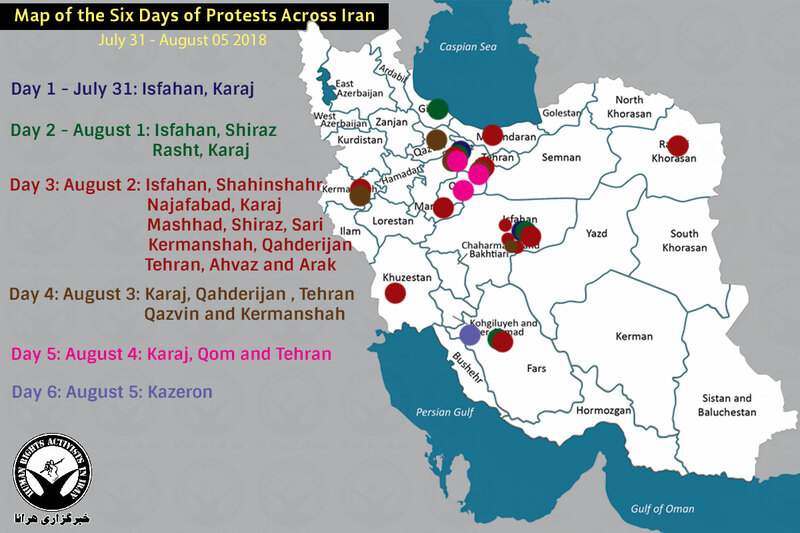 There are reports that protesters attempted to rally in Shiraz (capital of the Fars province), Tehran, Karaj and Qom, but strong police presence prevented these rallies from taking shape. Subscribers of Irancell, an Iranian telecommunication service provider, reported that mobile services in parts of central Tehran and the city of Zanjan were interrupted. Some of the clients of Operator Network, another cell phone service provider, reported that they received a message regarding a temporary and nation-wide interruption to their service. It is not yet clear whether this stoppage is part of the Iranian security apparatus’ attempt to control the protests. In previous protests, there was precedence in taking such measures to curb protests. Reza Shakarami, General Prosecutor for the Alborz province, denied reports attributed to him about the death of a young man from Karaj during a night protest. “The shooting [leading to the protester’s death] and the circumstances surrounding it are under investigation. Any quote cited from me regarding the murder of the victim by the rioters or any other individual is denied,” he said. The victim referred to by Mr. Shakarami was identified on social media as Reza Otadi. Salman Samani, the Interior Ministry spokesperson, has reacted to online invitations to assemble. “In the last month, dozens of invitations and calls to protest rising prices, inflation and living conditions have been widely distributed. The source of the majority of such calls is outside Iran, but the invitations have been reposted and shared by people inside Iran,” he said. Ali Motahari, Member of Parliament for Tehran, told a state-run newspaper that the authorities are trying hard to resolve the issues [the protesters have voiced their concerns about], and if the people wait and be patient a few more months, the conditions will improve. He also blamed certain movements who made attempts for the Iran Nuclear Deal to fail and whose actions paved the way for a Trump presidency, the pretext to withdraw from the **Deal. HRANA News Agency – At least one woman was hanged in Gharchak Prison in Varamin. According to a report by the Human Rights and Democracy Activists, a woman identified as Giti Marami was hanged in Gharchak Prison on Wednesday morning in Varamin. Marami, 34, was married and had a daughter.